What happened? Samsung’s Galaxy S7, released last year, was a very nice smartphone: comfortable to hold and a pleasure to use. It was Samsung’s best Galaxy model ever—not so much the new Galaxy S8, which goes on sale today and ships on April 20. The Galaxy S8 seems to suffer from the same disease afflicting Apple’s latest MacBooks: engineering navel-gazing leading the product design astray. The Galaxy S8 is hard to use one-handed, because much of the screen is too far from the finger reach of most people. I tested the smaller 5.8-inch unit; I can only imagine the larger 6.2-inch Galaxy S8+ model has to be double-handed like a small tablet. Yes, the Galaxy S8 includes Samsung’s one-handed mode optimizations (in the Settings app) available to previous Galaxy models, but with the new taller aspect ratio of the Galaxy S8, one-handed use is still awkward. There’s no real benefit to that extra height. The curved sides create a bowed effect for the screen, which can make text on the edges harder to read. I don’t get the appeal. It’s a tad wider than the Galaxy S7’s screen, but the curved areas become avoidance zones for information. In effect, the Galaxy S8 is no wider. Because of the curved sides, the Galaxy S8 is also harder to grip. The wedge shape is less comfortable to press against your hand and harder to pick up from a surface. The midnight black Galaxy S8 I tested was slippery to hold, similar to Apple’s glossy black iPhone 7. (The casing almost feels oily.) Due to the slipperiness, it’s also harder to pick up. I have not had Galaxy S8s with the other two finishes—arctic silver and orchid gray—to test to see if they are as slippery. The Infinity screen is glossy, so it’s one big mirror in many lighting conditions. Ergonomics matter, but not apparently to the Galaxy S8’s design team. The Galaxy S8’s ergonomic issues don’t go away as you use it, though you’ll learn to adapt somewhat out of necessity. I also found the touchscreen on the Galaxy S8 to be less responsive than those on the predecessor Galaxy S6 and Galaxy S7, or the iPhone 6, iPhone 7, and Google Pixel XL. At least Samsung kept the audio jack. I’m still not happy about its removal from the iPhone 7. Every new smartphone has better specs, and the Galaxy S8 is no exception. (One exception: Its rear camera hasn’t yet made the leap to dual cameras like other flagship smartphones have.) But any flagship is more than capable enough, so specs alone are no reason to ditch any recent flagship smartphone you may have. Beyond the weakened ergonomics and the beefier hardware, the Galaxy S8 has a few new features. One is the new facial recognition system for unlocking the phone. It’s not especially secure, so Samsung won’t let you use it for purchasing through Android Pay or Samsung Pay. It’s also a bit slow to recognize your face (and can’t deal with things like people wearing glasses), similar to its predecessor in the ill-fated Galaxy Note 7. But you might want to use it to unlock your phone rather than fiddle with the hidden fingerprint sensor. Personally, I find entering an old-fashioned PIN easier and faster than going with either the fingerprint sensor or facial recognition. Another new feature is Bixby, Samsung’s attempt to join the virtual assistant party. (Siri, Google Assistant, and Cortana must be feeling a lot less exclusive these days with Amazon Alexa and now Samsung Bixby joining the fray.) But Bixby doesn’t work yet; Samsung pulled it at the last minute and now says it will be made available through an upgrade later this year. Rumor has it Bixby couldn’t understand English. I don’t care whether Bixby works or not, since I struggle to be understood by Siri, Google Now, and Cortana (I guess I slur my words too much) and thus am an outsider in the world of voice assistants. But if you are a fan of voice assistants, you still have Google Assistant on the Galaxy S8—it is an Android phone, after all. Samsung would prefer people use its Bixby assistant instead of the standard Android one, just as it wants people to use Samsung Pay instead of Android Pay, but you don’t need Bixby to get a voice assistant on the S8. Samsung’s internet browser is also a bust: Use Google’s Chrome instead, so your Galaxy S8 browser syncs with your other devices’ Chrome browsers. I understand why Samsung wants to steer users to its proprietary services, for data mining and other income possibilities, but ecosystems only work when they are broad, and Samsung’s ecosystem is confined to its mobile devices. The Galaxy S8 uses the USB-C port standard, joining the Google Pixel in jettisoning MicroUSB. You’ll get two adapters in the box: one to connect the Galaxy S8 to any MicroUSB cables you already have, and the other to connect the Galaxy S8 to a standard USB-A cable. Try not to lose them! Finally, there’s Dex, Samsung’s add-on dock that lets you use the Galaxy S8 in full-screen mode on a monitor, with a keyboard and mouse, to essentially convert the smartphone into a lightweight PC. Does it work? You’ll have to read InfoWorld’s [[add link here]]review of Samsung Dex]] to find out. 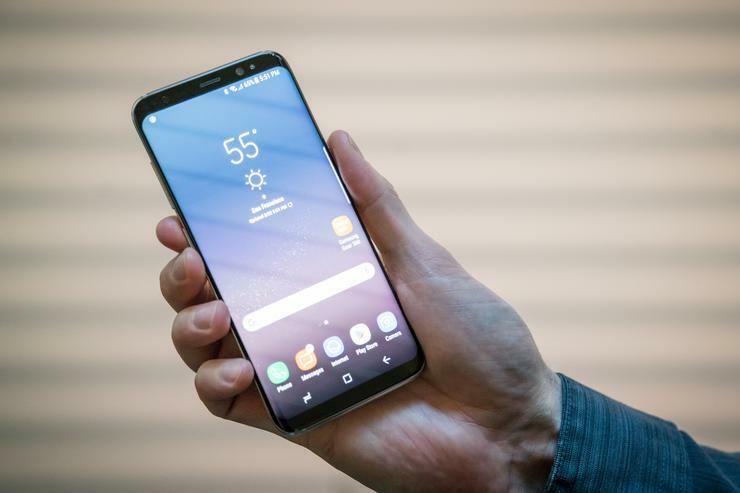 The Samsung Galaxy S8 costs $720 and has a 12-megapixel rear camera, an 8-megapixel front camera, 64GB of internal storage, a MicroSD slot that supports up to 256GB cards, 802.11a/b/g/n/ac Wi-Fi, NFC radio, and a 300mAh nonremovable battery. It’s available from all four major U.S. carriers, comes in three color choices (arctic silver, midnight black, and orchid gray), and runs Android Nougat 7.0 (not 7.1). The larger Galaxy S8+ costs $940.